The marked and fated trees can be seen. We hope this will not lead to a rise in the re-sprouting of the laurel and expect it to be sprayed in the spring to keep it under control. The lake is tranquil. 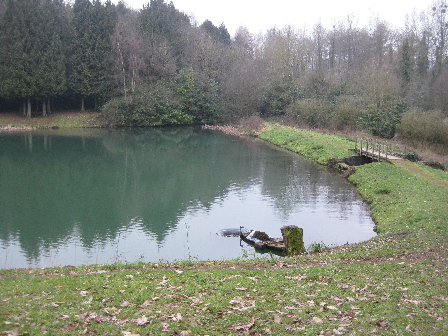 At the bottom of the picture you can see the old sluice waterfall which keeps the lake at an even height. The fishermen have been dragging the weed out of the side of the lake during the closed season for fishing. We re-visited this site to carry on with the laurel clearance and to burn off the old brush. Quite a bit of laurel had fallen over the trackways due to the recent heavy snow so this was tidied up. It is a great shame that a lot of the large redwood trees have now been marked so that the timber can be sold and contractors will arrive on the site to clear them. The Forest of Dean is a working forest and trees are sold off for their timber but such magnificent and mature trees as these will be sorely missed. This is an old photograph of the waterfall at Clanna - note - there is no laurel evident!